Challenge:LA is Los Angeles’ first civic technology challenge to leverage the collective ingenuity of its citizens to solve some of our most pressing problems. In partnership with the Office of Mayor Eric Garcetti, we encourage designers, developers, artists, activists, students, data scientists, policy makers, academics, entrepreneurs, and citizens at large to submit a solution to one or more of the following challenge areas: transportation, community, water conservation. Challenge winners will have the opportunity to present at the #techLA Conference on October 10, 2015 and participate in Accelerate:LA, a four-month city accelerator program in Los Angeles designed to encourage the sustainability of each solution and create real impact. HOW MIGHT WE HELP FACILITATE ACCESSIBLE PARTICIPATION IN CIVIC ISSUES AND INCENTIVIZE DISENGAGED POPULATIONS TO CONNECT WITH CIVIC LIFE? • Drive economic activity by helping entrepreneurs launch local small businesses. Applying was an interesting and productive experience. Even if I don’t win, I developed some useful new ideas and approaches. And, it forced me to develop the new Shared Situations website sooner! I thought you might find my application interesting. Below are some key parts. Groups come alive and thrive when people relate to the proximity of their shared situation. Enter up to 100 words. People are more likely to be active and effective in their communities when they can see and use the same processes that work with friends, associates and neighbors. The collaborative mobile Shared Situation Guide uses the scalable four processes of the ProxThink growth model. A group can improve a smaller-scale situation by relating more directly to the proximity of their shared situation, which the guide teaches and enables. The guide is extended and enhanced by the Shared Situations website, providing in-person and online workshops, as well as searchable and shareable guide starter sets and larger-scale public collaborations. Enter up to 250 words. Describe the target audience or community your project aims to serve. How does your solution impact their role or participation in the community? The collaborative mobile Shared Situation Guide is for a group of people with a shared situation. It can scale from small groups to large. At larger scales, human limits are more likely to be reached than technological limits. At that point a “team of teams” approach might become appropriate, and the ProxThink growth model processes used in the guide scale for this as well. Through the networked mobile collaboration taught and enabled by the Shared Situation Guide, the proximity becomes more of living thing that people who share a situation relate to and help keep alive. Through that, groups come alive and thrive. When people see the same processes being effective at different scales, they become more likely and more able to become active in public collaborations. These public collaborations can be for situations shared by larger groups, such as neighborhoods, communities, cities and regions. The larger proximities of such shared situations are then more likely to become living things that people help keep alive. People can learn to use the Shared Situation Guide on their own or through in-person and online workshops provided through the Shared Situations website. There they can also find, share and comment on guide starter sets for common situations, leveraging what others have learned and created for similar situations. More intimate experiences with the Shared Situation Guide can lead to larger community experiences and outcomes enabled by public collaborations people find and join via the Shared Situations website. The reverse may happen as well. Describe how your project either utilizes publicly available data or creates new open data to enable better decision-making or an improved process [creating more equitable mobility / incentivizing disengaged populations / facilitating water conservation] in Los Angeles. There are several nice things related to data about the Shared Situation Guide. First, within the guide, it is easy to link to web pages that provide needed data. Second, since the option of spreadsheets is literally built into any guide text document, it is also easy to include data in a group’s customized guide documents. Third, the ProxMonitor process and section of the guide lends itself to data and reminds people of the important role data plays in relating to proximities and keeping proximities alive. Depending on their shared situations, groups using the Shared Situation Guide for smaller scale collaboration or larger scale public collaboration may utilize publicly available data, create new open data, or both. New open data may get created as part of the ProxMonitor process, when groups choose to share ProxMonitors with other people and groups. This might occur simply as information sharing. It also might occur when ProxMonitors relate to multiple proximities and people see that the ProxMonitors can benefit multiple proximities and situations simultaneously. Are there any datasets to which you would like access to aid in the development of your solution that are not currently publicly available? This would depend on the specific public collaborations that people start and join on the Shared Situations website. How will your project improve the outcomes and/or experience of people living in Los Angeles as it pertains to [transportation / community / water conservation] in an evidence-based way? What types of decisions or processes does your project inform? The Shared Situation Guide and the Shared Situations website can improve the outcomes and/or experiences of people living in Los Angeles in both general and specific ways. The general ways have been covered fairly well in previous sections. Specifically, the guide and website can have evidence-based impacts and inform specific decisions and processes. To better understand, I’d suggest that anyone evaluating this application spend some time with the guide and website. The website is at http://sharedsituations.wordpress.com. Although the guide is linked to from the website, the guide is also at http://quip.com/XUclAKWY4Lmj. A visual asset I’m including is the Flow Graphic shown on the guide document called Using the Guide and Linked Documents. The Flow Graphic shows a looping sequence for using the growth model processes that are part of the Shared Situation Guide. By using these processes, people naturally create ongoing evidence-based monitoring and make decisions based on information related to their shared situation. It should be noted that ProxMonitors can be any combination of technological monitors and/or human monitors. Smaller scale examples of such evidence-based monitoring and relevant decision-making can be seen in two ProxThink guide starter sets found on the Shared Situations website, one for organizing a picnic and one for a shared kitchen. 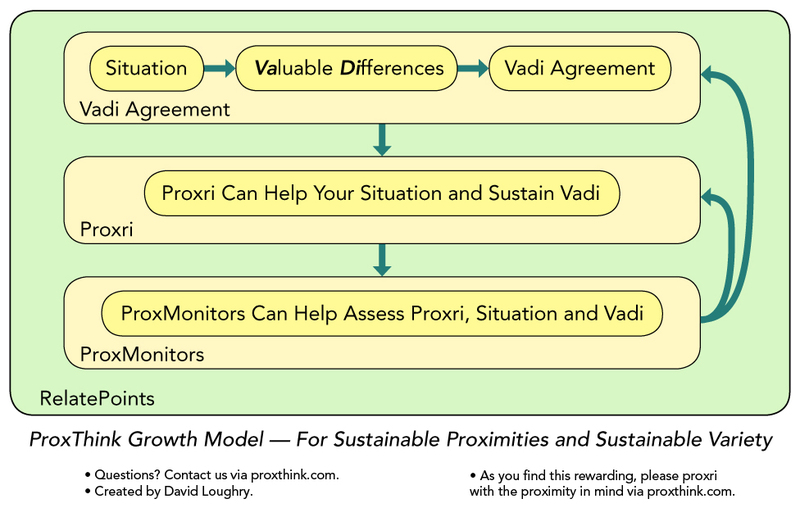 A larger scale example would be using the ProxThink growth model for the California drought, which could become a collaboration joined via the Shared Situations site (see this link: http://wp.me/p1Ry8Q-fI). Describe how your solution creates value for its end-users and could scale in a sustainable fashion? I’ve covered how this project creates value and scales. Here I’ll look at sustainability and scaling, both in terms of technology and the concepts. Technology: The Shared Situation Guide is a set of linked Quip documents with explanations for using them. Here’s how Quip is described: “Quip changes the way teams work together. Quip combines documents, spreadsheets, checklists, and chat in a simple interface that makes collaboration easy. With Quip, you work with people, not files. Thousands of companies from a wide range of industries have adopted Quip to make communication and collaboration more efficient.” The guide could be adapted to other major platforms. However, Quip is the most functional, elegant and multi-platform (iOS, Android, Windows, Mac). Since Quip is built for large corporations, and I’m not locked into Quip, the technology scales and is sustainable. A similar argument could be made for WordPress, where the Shared Situations website is hosted. Concepts: With the ProxThink framework I created the sustainable proximities approach. From that evolved the idea of sustainable variety. I think variety in life is critical to health, happiness, and vibrant communities, and that variety and sustainability reinforce each other and enhance each other. The Shared Situation Guide and Shared Situations website are real-world implementations of the sustainable proximities approach, and I think have a solid chance of increasing sustainable variety. Also, a focus on keeping a proximity alive is inherently more oriented towards sustainability than focusing on single elements, such as individual people, businesses or organizations.